I know. The previous post was very verbose, and the lack of photos and variety in my blog make me sound more uninteresting than I probably am. I’ve done this before and I’ll do it again now. Here are photos of random things I love, with brief descriptions about them. And yes, the title is a quote from Hamlet. 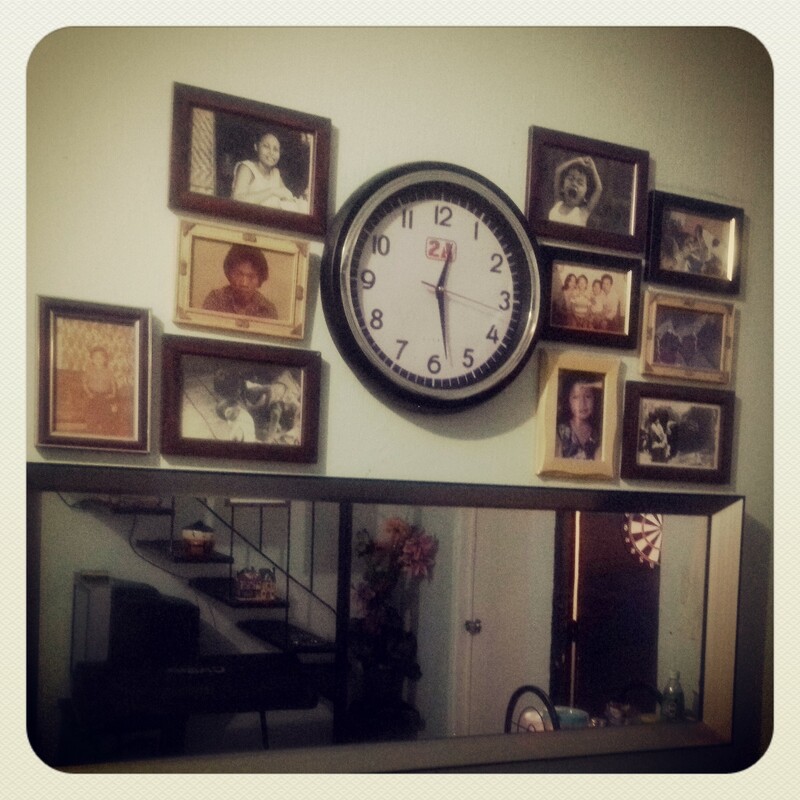 My favorite part of the house, for obvious reasons. 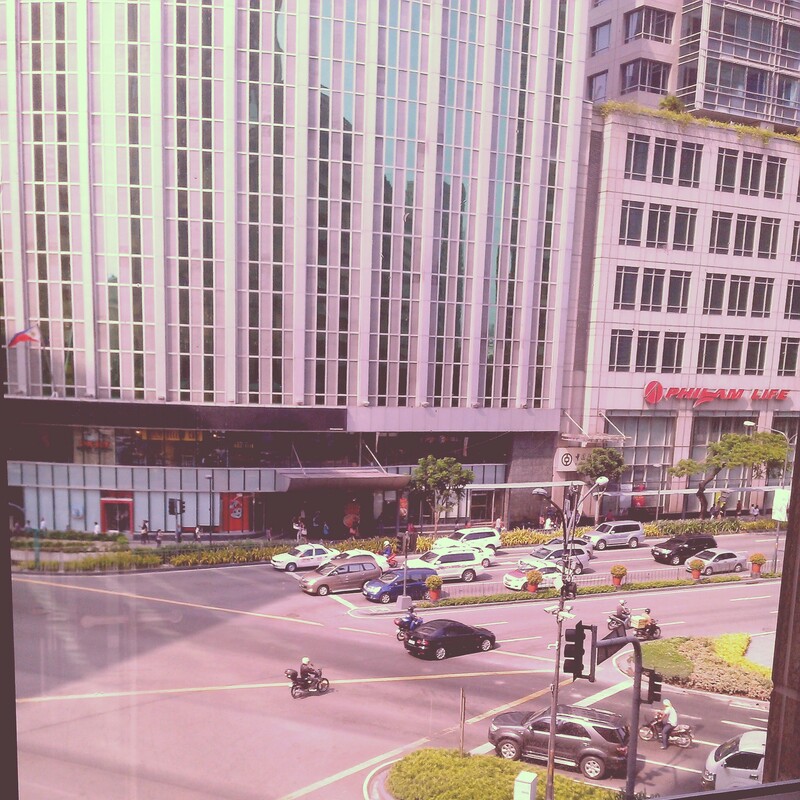 I’m back working in Makati. Not sure for how long, and that’s both exciting and terrifying at the same time. 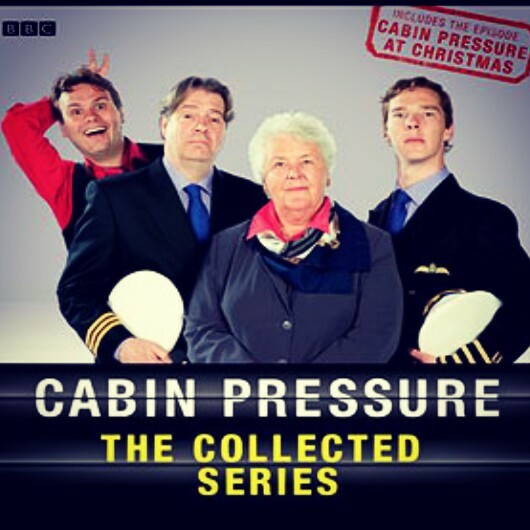 Cabin Pressure. The only radio comedy I listen to. It’s hilarious. What else can I say? 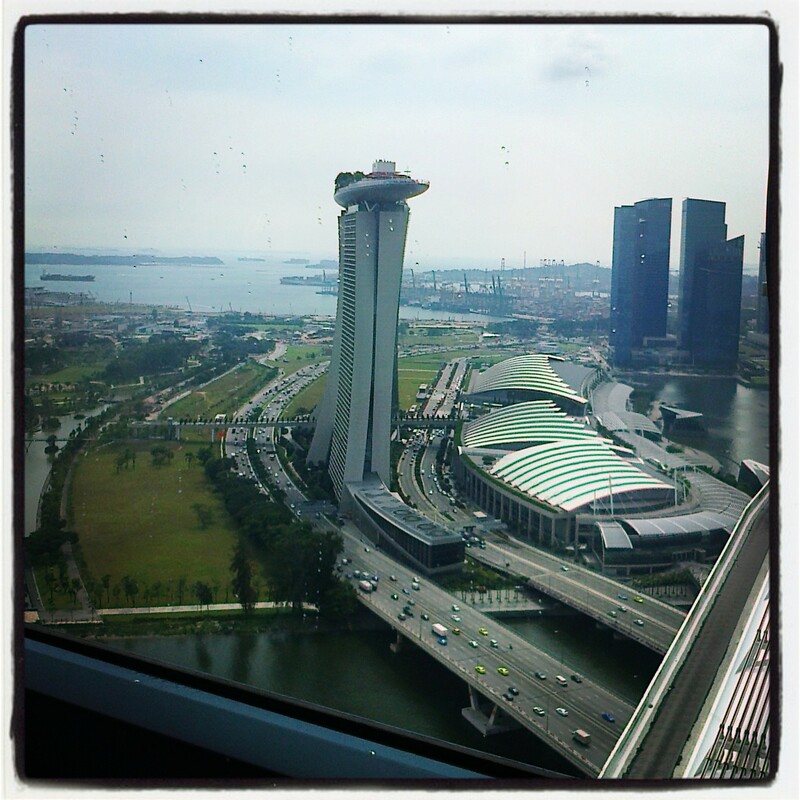 I kind of miss Singapore. Or maybe just the idea of being somewhere else. 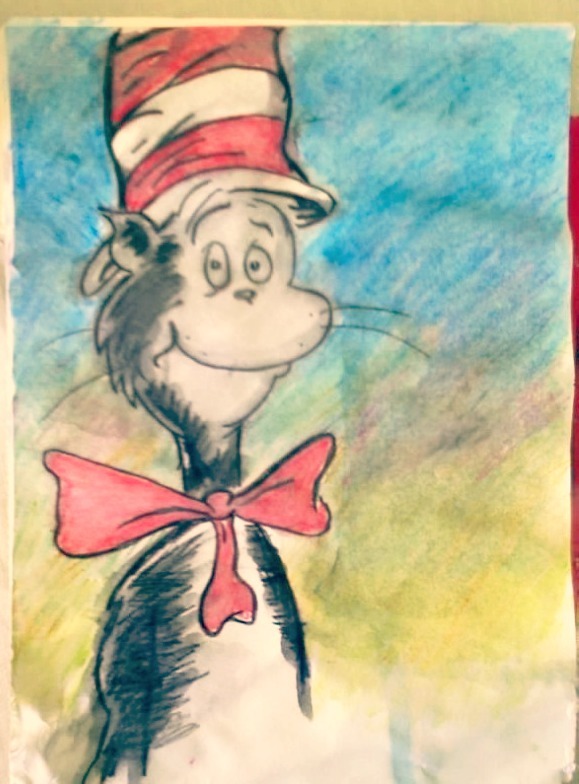 One time when I was bored out of my wits, I drew the Cat in the Hat. 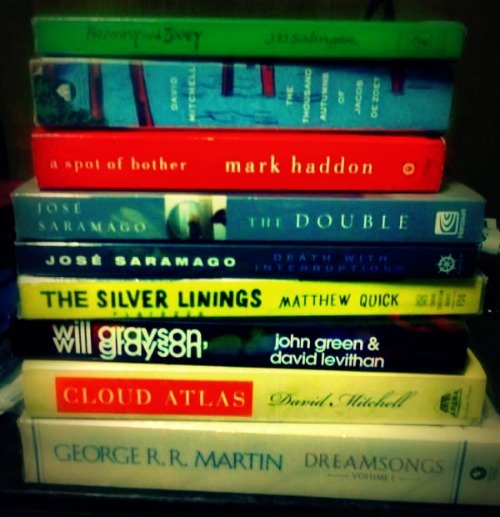 Books I bought with the GCs I won early this year. 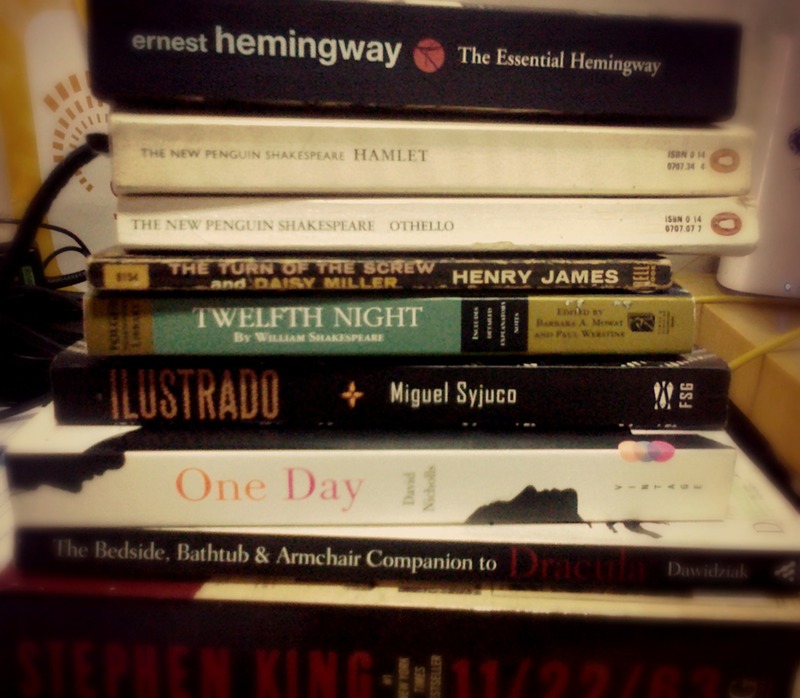 And the books I bought just out of impulse. Together, they look like this. 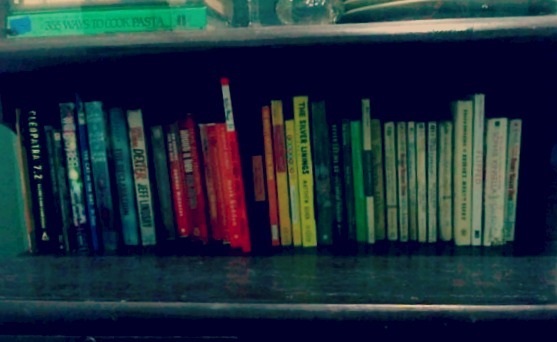 Arranged by color, not by height. 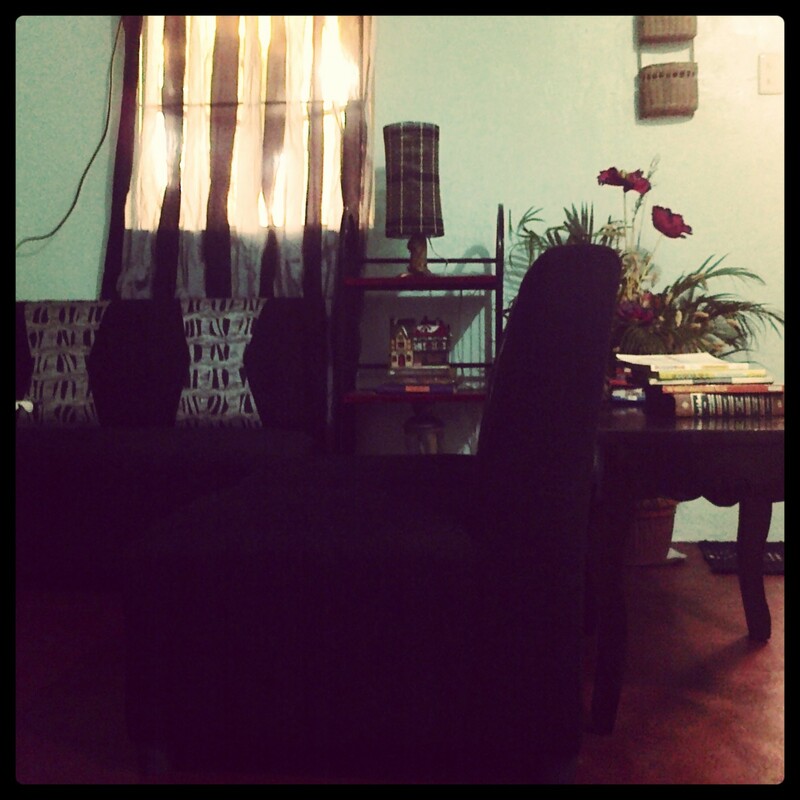 Because it looks prettier that way. 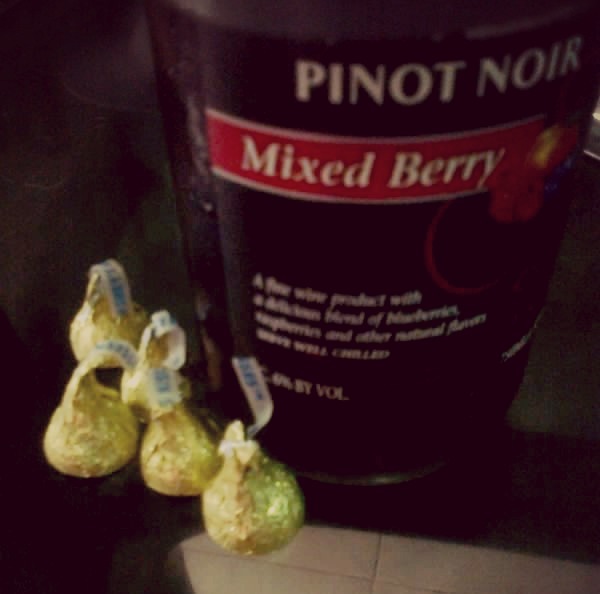 Staple cure for being sad. Let me start off by saying that I really tried to read more books this year. Granted, not all of my reading choices were particularly good (Yes, I managed to finish 50 Shades of Grey. Yes, I regret it. Let’s move on). But at least now I can say with absolute certainty that it is full of crap. That being said, it’s that time again when I make a list of the top 10 books I’ve read all year. I know 2013 hasn’t officially ended, but I doubt I’ll be able to finish more books by December. I’m backlogged as it is with the reading challenge I started in Goodreads. I set a total of 30 books I needed to finish by the end of the year. I’m currently 14 books behind schedule, Goodreads tells me. But on a lighter note, I did manage to read some pretty cool books, not counting Emily Giffin’s Something Borrowed and E.L. James’ 50 Shades of Grey. I’ve also rediscovered my love for Shakespeare, specifically Hamlet. Plus, I was able to get a copy of Sherlock: The Casebook, based on the BBC production, and reading it was awfully entertaining. Anyway, here are my top 10 books. Be warned. This is going to be a long entry. 1. Extremely Loud and Incredibly Close by Jonathan Safran Foer – this book is a work of art. And not like other good books are works of art. If this book were music, it would be one of Boccherini’s cello sonatas. And if it were a painting, it would be a Matisse. If it were poetry, even, it would be one of Keats’. It has a gentle, melancholic flow to it, sometimes playful, other times funny, but overall contemplative. Favorite quote: I like to see people reunited, maybe that’s a silly thing, but what can I say, I like to see people run to each other, I like the kissing and the crying, I like the impatience, the stories that the mouth can’t tell fast enough, the ears that aren’t big enough, the eyes that can’t take in all of the change, I like the hugging, the bringing together, the end of missing someone. 2. This is How You Lose Her by Junot Diaz – a friend recommended I read this and I’m grateful I took her advice. The book offers an interesting view of relationships, love, and life. The book is a compilation of stories about Yunior, a Dominican, and the different relationships he’s had from youth to adulthood. I mostly enjoyed Diaz’ metaphors; I’ve always liked people who could state truths in an original but piercing manner. Favorite quote: You try every trick in the book to keep her. You write her letters. You quote Neruda. You cancel your Facebook. You give her the passwords to all your e-mail accounts. Because you know in your lying cheater’s heart that sometimes a start is all we ever get. 3. 11/22/63 by Stephen King – I’m a little embarrassed to say that this is the first Stephen King novel I’ve read. I’ve never really developed a liking to horror novels, but I couldn’t resist reading this thriller. It has JFK and time travel in it. I just HAD to. Plus, King is a brilliant storyteller. He’s not overly dramatic and doesn’t drone on with painfully detailed descriptions of almost everything that you lose focus on what you’re reading. Reading this book has been a great adventure. And wow is it long! Favorite quote: Don’t look back, never look back. How often do people tell themselves that after an experience that is exceptionally good (or exceptionally bad?)? Often, I suppose. And the advice usually goes unheeded. Humans were built to look back; that’s why we have that swivel joint in our necks. 4. The Cuckoo’s Calling by Robert Galbraith (J.K. Rowling) – after being disappointed with The Casual Vacancy, this book was a pleasant surprise. It isn’t as riveting and as the Harry Pottery series, but why would it be? It still keeps you on a short leash, though, and you start missing it when you put it down long enough; you start thinking about the absurdity of the web of controversies in which most characters are involved. By the time I finished it, I did want to read another Cormoran Strike case immediately. Favorite quote: How easy it was to capitalize on a person’s own bent for self-destruction; how simple to nudge them into non-being, then to stand back and shrug and agree that it had been the inevitable result of a chaotic, catastrophic life. 5. Flipped by Wendelin Van Draanen – I’d seen the movie first many years ago before I realized it was based on a book. The movie adaptation was brilliantly set in the 60s. It captured the innocent and lighthearted spirit of the book. The book was set in present day and is equally lovable. For me, Flipped is a profound book about self-discovery disguised in teen fiction about a thirteen-year-old girl’s first love. Favorite quote: A painting is more than the sum of its parts,’ he would tell me, and then go on to explain how the cow by itself is just a cow, and the meadow by itself is just grass and flowers, and the sun peeking through the trees is just a beam of light, but put them all together and you’ve got magic. 6. The Silver Linings Playbook by Matthew Quick – Pat Peoples is adorably hilarious. This is such a feel-good love story about two unusual people finding their way through their own craziness and in love. Reminds me a bit of Benny and Joon, now that I think about it. The book leaves me with the same feeling of fondness for the characters as much as Joon and Sam did. Favorite quote: So I’m thinking this is the part of my movie where things appear as if nothing is going to work out. I have to remind myself that all movie characters go through this sort of dark period before they find their happy ending. 7. Bridget Jones’ Diary by Helen Fielding – Bridget Jones is not my personal heroine. I’m nothing like her, but I find her ridiculously lovable. You can’t help but root for her throughout her misadventures and be genuinely happy when she finally ends up with Mark Darcy. And now that Helen Fielding’s just released Bridget Jones: Mad About the Boy (now featuring a middle-aged Bridget), I can’t wait to know how her life turns out. Favorite quote: When someone leaves you, apart from missing them, apart from the fact that the whole little world you’ve created together collapses, and that everything you see or do reminds you of them, the worst is the thought that they tried you out and, in the end, the whole sum of parts adds up to you got stamped REJECT by the one you love. How can you not be left with the personal confidence of a passed over British Rail sandwich? 8. Sherlock: The Casebook by Guy Adams – The Casebook is basically like a behind-the-scenes look at all the episodes from the two seasons of Sherlock, but more enjoyable. The book is a split between John Watson’s journal, with a lot of funny exchanges between him and Sherlock through post-it notes, and commentaries by Guy Adams about each of the six episodes, giving readers an exclusive scoop about the littlest details in the show that makes it so fantastic. Favorite quote: (from Sherlock, in response to one of John’s journal entries) If you ever use this many quotation marks in a sentence again, I’ll have the locks changed while you’re out. 9. The Silent Stars Go By by Dan Abnett – I’ve been a Whovian for only nearly a year, but I’ve become a huge fan ever since watching my first episode. I believe Doctor Who is one of the most brilliantly written shows not only today but of all time. It’s difficult not to be amazed with The Doctor. And because I got officially hooked with the show because of The Eleventh Hour episode, I consider Eleven to be my Doctor, but Ten is easily a close second. This year is the show’s 50th anniversary, and BBC has produced a lot of merchandise commemorating this event, including eleven novels, each one featuring a different Doctor. The Silent Stars Go By is Eleven’s story, so I bought it first. And although Dan Abnett doesn’t belong in the newer generation of Doctor Who, he still manages to perfectly capture the voices of Eleven, Amy, and Rory. Plus the story features the Ice Warriors, which are menacing and scary Martian soldiers. Overall, perfect Christmas story, if I may say so. This may be considered cheating because my favorite quote is not from the story itself, but from the author’s foreword. But as it’s still part of the book, I think it counts. Favorite quote: We measure our personal journeys against the space-time curve of the programme’s history. Certain moments along that curve vividly evoke special things for each of us, and whisk us back to a particular time and a particular place, like a Proustian TARDIS. Yes, I know. I can’t believe I just wrote ‘Proustian TARDIS’ either, but we’ll move past it and remain friends. 10. Hamlet by William Shakespeare – I love Shakespeare, okay? I love Hamlet, and once you get used to the flow of the Shakespearean language, it gets easier for you to read it. Hamlet contains some of my favorite quotes of all time, and you can’t really fully grasp the weight of each line if you don’t know the context from which it came. I love the complexity of Hamlet’s character, his demise at his uncle’s betrayal and his inner dilemma between suffering and death. It’s very difficult for me to pick just one favorite quote, but I have to. This is from Hamlet’s love letter to Ophelia when he was already suspected of losing his mind. Was Hamlet going crazy because he was too besotted with Ophelia as his letter implies; or was his infatuation merely the result of his madness? Huh. Insanity or true love? Is there really a difference? Regardless of the real motive, Hamlet’s words still reverberate through me.